This simple design is highly effective and works perfectly in both domestic and commercial premises. The powder coated aluminium frames are lightweight and will remain rust free. 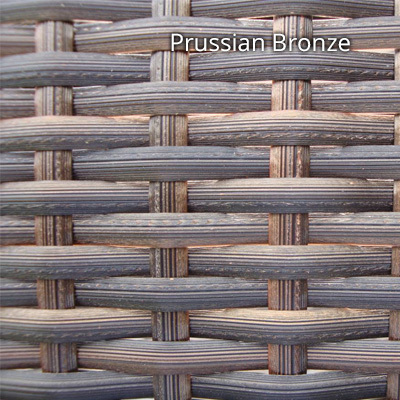 The vibrant Prussian Bronze colour and stylish tempered glass top combine with the flat weave to great effect. The feet are capped with toughened plastic and further reinforced with aluminium panels at the bottom. The fibres are stabilised to protect against colour-fade, cracking and splitting. The fibres are also 100% recyclable and pre-testing is used to guarantee their suitability of outdoor use against a range of temperatures and to all types of water.